Gaffing Undersized Shark That’s Biting My Thumb? 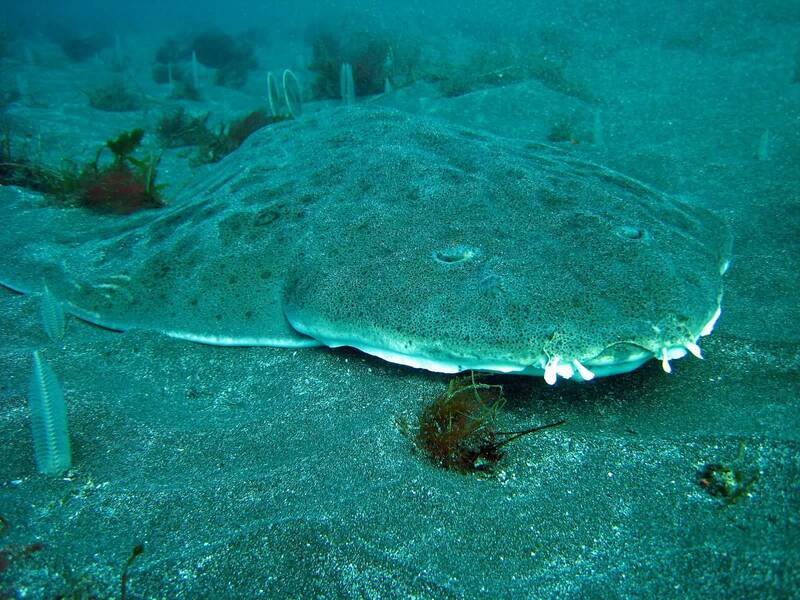 Question: I recently went fishing with a friend and hooked into a 4-foot angel shark (which I had mistaken for a large skate). When I got it close to the boat, I reached down to unhook it and release it (still not thinking it was a shark). As I got close to its mouth it thrashed around and bit my thumb pretty good (suddenly I realized I was in the jaws of a shark). The shark wouldn’t release my thumb, and me being in the boat and it still in the water, the only thing I could think of doing at that moment was to gaff it and bring it on board the boat. When I gaffed it we got it on the boat, my friend held it down and used a screwdriver to pry its mouth open. By this time the shark had lost a lot of blood. Answer: Sorry about your thumb, but there are no size or weight limit restrictions for angel sharks. Gaffs may be used to assist in landing any fish that is legal to take and of legal size, but gaffs are not a legal method of take for sharks or any other species. In a case like this where it sounds like your personal safety (thumb) was an issue, you can use whatever means necessary to ensure your safety. Afterwards, when the immediate threat is over, you must abide by current rules and regulations. If the species or size is illegal, you may not possess it. And as in this case, if you caught the shark illegally, you must release it, dead or alive. Hunting ducks on mountain lakes? Answer: Yes, it would be legal to hunt waterfowl on the lake so long as you are not trespassing on private property or violating some other law such as shooting too close to an occupied dwelling. Trail cameras – baiting vs attracting? Answer: Yes, that is the issue. Intentional acts that disrupt any birds’ or mammals’ normal behavior patterns (California Code of Regulations Title 14, section 251.1) or feeding big game mammals (CCR Title 14, section 251.3) is prohibited. Even if you are not intending to draw an animal in for the purpose of hunting, putting out any type of attractant still falls under the definition of baiting. The definition of “baited area” can be found in the California Code of Regulations Title 14, section 257.5. And under this regulation, the use of any substance (real or artificial) that is capable of attracting an animal to an area, and when used causes the animal to feed (on the substance), is prohibited. Generally, aerosols sprayed into the air are permissible because there is nothing to feed on. But the same products applied to a surface (e.g. tree, brush, rock, etc.) where the animal licks, eats, chews, nibbles, etc. the surface is considered feed and is a violation. Will CDFW plant fish in private duck club pond? Answer: No, CDFW will only plant fish in public waters that are open and available to the public to enjoy. If this is a private pond, you will need to get a private stocking permit from CDFW and then buy fish from a commercial fish farm, which may also stock them for you. This entry was posted in Saltwater Fishing and tagged aquaculture, baiting, Duck Hunting, fish stocking, ocean fishing, photography, regulations. Bookmark the permalink.